Credit card companies are known for their fees – late fees, over the limit fees, annual fees – you name it, you can be sure there’s a credit card company that’s already thought of it and tacked it on to its customer accounts. In recent years, though, there’s been a trend towards eliminating annual fees in their entirety. Of course, every card network has its own guidelines and some will waive the annual fee for a year, but after that, consumers are hit with it every year. Still, there are those that have managed to keep an annual fee out of the mix in their offerings. As a result, many consumers have found these to be just what’s needed in their financial arsenal. Ah – but not all no annual fee cards are created equal. Do your homework – it can mean the difference of hundreds of dollars every year and don’t underestimate good customer service. No annual fee credit cards are a great way to keep the costs of owning a credit card in check. Still, it’s important to keep perspective and understand that sometimes, there are other reasons why someone would choose an annual fee card over one that doesn’t tack the pesky fee onto its offer. Things like APR, perks and benefits and other rewards play a role in consumers’ decision making process. Add to the mix the fact that credit card companies are quite competitive and it becomes clear that the answers aren’t always clear. Ah, but that healthy competition is good for us as consumers and provides many opportunities to cut our own costs while adding a new credit card to our budgets. Blue Sky from American Express offers a bonus 7,500 points when you spend $1,000 within the first 3 months of membership. This is automatically eligible for a $100 statement credit. Not only that, but we like the flexibility in the rewards programs. You’ll earn a point for every dollar you spend and you are afforded unlimited travel choices, too. The best part is there are no blackout dates or other restrictions – choose any airline, any hotel and any car rental. Another reason American Express remains a formidable force in the credit card industry is its flexibility for members in how they pay their balances. There was a time when American Express was a definitive charge card; these days, it’s changed with the needs of its members and future members. The Blue Savings Program is another reason why this is a good choice for consumers. It offers many ways of saving – whether it’s discounts at hotels, restaurants or retailers. And, of course, there’s no annual fee. 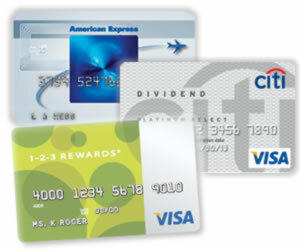 Another great no annual fee credit card, the Citi Dividend Visa is offering for a limited time $100 cash back. Just make $500 in purchases during the first three months of opening your account. Not only that, but there’s also a 0% intro APR on both balance transfers and purchases for the first 12 months. After that, enjoy a low APR between 12.99% and 22.99% – note, though, it’s based on your credit history. You’ll also earn with this credit card 5% cash back eligible purchases at Zappos.com, fitness clubs and drugstores from now until the end of March and each new quarter brings new rewards categories that qualify for additional cash back. All of your other purchases earn you 1% and the no annual fee is the perfect finishing touch on this credit card offer. This is a simple credit card that makes it easy for card members to earn and spend their rewards. You’ll earn 1 point for every dollar you spend anywhere, 2 points for every dollar you spend in any Kroger or its family of stores (note, though, that it’s not applicable at the Kroger fuel centers) and 3 points for every dollar you spend on the Kroger brands. We like 1-2-3 Rewards Visa because of the 0% APR you’ll enjoy for both balance transfers and purchases for the first nine months. You’ll reap the benefits of the Visa zero fraud liability promise and, of course, there’s no annual fee with this credit card offer. We wanted to include a credit card offer for college students, too. With the changing laws, it’s difficult to understand what’s legal these days, especially when it comes to younger consumers who’ve not yet reached the age of 21. The Citi Forward Card for College Students is one way younger adults can begin to build their credit in a responsible manner. They’re rewarded for the strong financial habits they show, such as staying within their credit limits and making on time payments. Those rewards include a lower APR. They will also enjoy savings and up to 5 x the rewards points. College students earn 5 Thank You points for ever dollar spent at restaurants and on other entertainment and they’ll also enjoy 100 Thank You points for every billing period that their payment is on time and they’re within their credit limit. No annual fee and a seven month intro APR on purchases makes it a great tool for today’s young college students. Finally, we take a look at one of the newer credit card offers on the market. The Discover It credit card is the new kid on the block and it’s going to mean big changes in how consumers view credit and how the competition rises to match this great offer. There’s no annual fee, of course, but there’s also no over the limit fees, no foreign transaction fees and even your first late payment, should that ever happen, is waived – and Discover won’t increase your APR, either. You’ll enjoy 5% cash back in rotating categories and great online tools to help you find exactly what you need. You can choose your own due date and speak to a live representative anytime. Enjoy for fourteen months a 0% intro APR on purchases and balance transfers. This is a great credit card offer and one consumers are turning to in droves. There are a few things to keep in mind if you’re shopping for a no annual fee credit card. The biggest thing is the excellent credit rating that’s usually required to qualify. Also, be sure to closely review the terms and conditions – breaking the rules might be the end of the no annual fee dynamic and each card company is different, so it’s always wise to not only review the terms ahead of time, but anytime your credit card company sends revisions. Finally, you might want to consider the advantages of a balance transfer credit card. These too often have no annual fees and it makes for a great choice if you’re looking to save money on interest every month while paying down credit card debt. Compare your offers so that you’re making the best decision. Remember, too that banks and card companies are very competitive these days. There’s no end to the number of new credit card offers that hit every year and it’s all about the profits. Still, it’s a good thing for the American consumer. Use that to your advantage as you go about the business of finding the perfect credit card for your unique needs.